SEVEN of the top eight seeds have moved on to the quarter-final round. The 16-team field tipped off at the B.C. 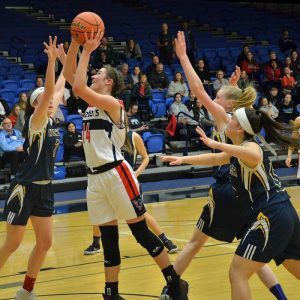 Secondary School Girls AA Basketball Championships on Wednesday at Langley Events Centre with the lone upset of the day belonging to the tenth-seeded St. Thomas More Collegiate Knights (Burnaby) who knocked off the seventh-seed Duchess Park Condors (Prince George). Thursday’s quarter-final round will feature the No. 1 South Kamloops Titans against the No. 8 Seycove Seyhawks (North Vancouver) and the No. 4 Britannia Bruins (Vancouver) vs. the No. 5 St. Thomas Aquinas Fighting Saints. The bottom half of the draw has the No. 2 Langley Christian Lightning facing the No. 10 Knights and the No. 3 G.W. Graham Grizzlies (Chilliwack) vs. the No. 6 Vernon Panthers. Tip-off is at 3 p.m. for the first of the four games. For full results for all 16 teams from the first day, click here. The defending champions opened the tournament with a convincing win over the David Thompson Lakers, 90-26. Olivia Morgan-Cherchas scored 26 while Maddy Gobeil had 21 in the victory. The Lakers’ Maddy Wells led her team with six points. Twenty-one points from Chelsea Bradshaw and 15 apiece from Emma Bradshaw and Jill Bowering (who also had 13 rebounds) helped the Seycove Seyhawks (North Vancouver) tame the Lambrick Lions (Victoria) 67-39. Destiny Hanson’s 12 points paced the Lion attack. The Britannia Bruins (Vancouver) put up 50 first-half points in a thorough 86-60 win over the G.P. Vanier Towhees (Courtenay). The Bruins had four players in double figures with Surprise Munie’s 31 points and seven rebounds leading the team. Shemaiah Abatavo had 23. Emily Calder led the Towhees with 13 points. St. Thomas Aquinas (North Vancouver) used a stifling defence which kept the Smithers Gryphons to single digits in all four quarters in a dominating 82-23 victory. Offensively, Gemma Cutler had 16 points while Jessica Clarke had 11 points to go along with 15 rebounds. Smithers was led by nine points from Angela Jennings. The Vernon Panthers weathered an early Whistler storm, rallying from seven points down in the first quarter to take the lead at the half before winning 64-54. A big difference in the game was foul shooting as the Panthers went to the line 36 times, hitting 21 while the Storm sank seven of 14 attempts. Kelsey Falk was unstoppable for Vernon with 36 points and 20 rebounds. Ayden Kristmanson had 21 points and 15 rebounds for Whistler. The sister act of Julia (30 points, 16 rebounds) and Deanna Tuchscherer (26 points, 12 rebounds) combined for 56 points and 28 rebounds in a 92-56 win over the Little Flower Academy Angels (Vancouver). Kayla Canama led the Angels with 17 points. In the lone upset of the day among AA squads, the St. Thomas More Collegiate Knights (Burnaby) built an early advantage and led wire-to-wire, defeating the Duchess Park Condors (Prince George) 72-39. Brooklyn Monks scored 26 points and grabbed 10 rebounds for the Knights. Jasmin Schlick led the Condors with eight points and 17 rebounds. 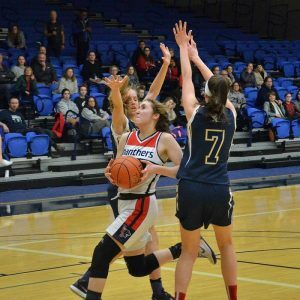 The Langley Christian Lightning shot 42.4 per cent from the field as they opened their tournament with a 95-35 win over the Westsyde Whundas (Kamloops). Makenna Gardner scored 33 points, connecting on eight of her 19 three-point attempts, to lead the Lightning attack. Lainey Shelvey finished with 10 points, eight rebounds, eight steals and a pair of assists. Kenya Reid scored 21 for Westsyde.